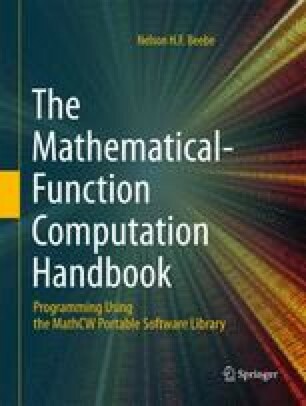 A large family of functions known as Bessel functions is treated in four chapters of the Handbook of Mathematical Functions [AS64, Chapters 9–12], with more coverage than any other named functions in that famous compendium. Although those functions were first discovered by Daniel Bernoulli (1700–1782), who in 1732 worked with the order zero function that is now known as J 0 (x), it was Friedrich Wilhelm Bessel who generalized them about 1824 and brought them to mathematical prominence, and they bear his name, instead of that of Bernoulli. Leonhard Euler (1707–1783) discussed their generalizations to arbitrary integer orders, J n (x), in 1764. Each cycle of a recursive process not only generates its own rounding errors, but also inherits the rounding errors committed in all previous cycles. If conditions are unfavorable, the resulting propagation of errors may well be disastrous. — Walter Gautschi Computational Aspects of Three-Term Recurrence Relations (1967).